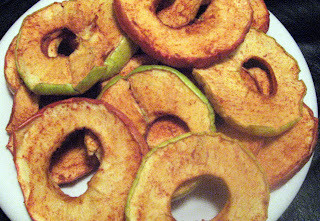 Drying cinnamon apples fills your home with the most super fabulous aroma and for those without a dehydrator, I'm told you can do this in your oven on the lowest setting. When I made these, I used a combination of Golden Delicious and Fuji apples. It's interesting to see the different the textures and tastes, depending upon the apple. I like the way the two colors looked together when they were finished. I cored the apples without removing the skin, as it contains so many nutrients. It can get a little tough, but I prefer the crunchiness. However, you can remove the skin if you choose. Cut apples slices or rings about 1/8 inch thick. Pre-treat apples with lemon juice. (I was lazy and squeezed half a lemon over the bowl of sliced apples, and mixed and massaged by hand. )You can dilute the juice of 1 whole lemon in a quart of water and soak the apples for no more than 10 minutes, rinse and pat dry. I was pleased to see they kept their color and didn't turn brown or shrivel up badly. These probably could have dehydrated longer, but they were really tasty, and didn't last long enough to even try that. Sprinkle slices with cinnamon. Massage ground cinnamon powder on both sides of apple slices. You can sweeten with agave nectar or raw honey, but they really taste good as is. Place on mesh dehydrator shelves at 105 - 110 degrees for 3 hours, flip and return to dehydrator for another 4-6 hours, or longer if need be. In the Oven: The temperature should be as low as you can set it, and leave the door ajar; place a fan so it blows across the opening and carries the moisture away. Try to place the slices on a wire rack so air can circulate, otherwise you will need to flip the slices repeatedly. This could take 12-15 hours, or more). Let cool and place in an airtight container. If you see any condensation buildup in the container, the apples are not done and need to be dehydrated more. Store in an air-tight container in refrigerator. mmmmmm.....used to LOVE dehydrated apples! They were surprisingly yummy! I had to dehydrate them a bit longer..but we devoured them within a day! It's hard to say exactly, Megan, depending upon how thick your slices are, the humidity in the air and what exact temperature your own dehydrator is at. Because of low temperature dehydration, I don't like to keep them around for long unless I put them in refrigerator. I've seen people freeze dehydrated fruit, although, I've not done that myself. I'd say they are def good for at least a week and maybe much longer, especially with the lemon that acts as a preservative.